ABMP + Employers = Big Savings! With the ABMP Affinity Partners Program, employers and individual locations with more than 5 ABMP members save money on membership, and get exclusive benefits! Your FREE business account gives you exclusive employer tools, like our ABMP job listings, roster manager, and valuable members-only discounts. Your employees save on each individual membership, which includes free CE hours, exceptional liability insurance, and more. Members from our sister associations for skin care, hair, and nails count to your 5 employee minimum, and save on membership too! Why Become an ABMP Affinity Partner? You’ll run a better business with a free ABMP business account, giving you employer benefits like your online employee roster, invites to webinars with free CE, ABMP client-education materials, and more! Your employees get a discount on membership. They’ll save big and get member benefits that protect them from lawsuits, build their hands-on techniques, boost soft skills like communication and sales, and save them money. You’ll have piece of mind knowing that your employees have their own individual insurance policies, protecting them if they are personally named in a lawsuit and potentially saving you some money on your business policy. You’ll save money with access to 50+ exclusive ABMP discounts! To get started, email employers@abmp.com or call 800-458-2267 and select the “Employers” option. Need more info? Contact us for our full Affinity Partners Brochure. If 5 or more employees sign up, they all save on membership! Earn free CE hours with for 120+ on-demand webinars! 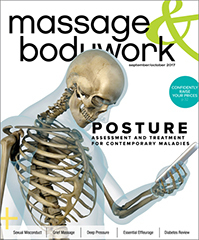 Award-winning publications, including Massage & Bodywork magazine. Client-education resources including Body Sense magazine. Your own ABMP account with access to our online roster manager to easily view certificates of insurance, renew members, and keep track of your team. 50+ members-only discounts on massage supplies, cell phone service, and more. A valuable recruitment tool for new employees, including access to ABMP job postings. To get your location enrolled in our ABMP Affinity Partners Program and start saving, email employers@abmp.com or call 800-458-2267 and select the “Employer” option! ABMP's award-winning magazine brings you more articles from the top names in the profession than anyone else. Learn new skills, gain information to boost your practice, and stay up to date on the biggest news in the profession. ABMP members get access to more than 125 archived webinars, with new ones happening all the time, plus select in-person training events. Join us for one of our upcoming webinars or events!